Two more years of embarrassment will be an object lesson to King voters who looked the other way for years at his racist words and outrageous observations. The Steve King representing Iowa today is the same man voters from our readership supported overwhelmingly in nine general elections. His body ages, but his ideas don’t. Yes, we endorsed King’s opponent J.D. Scholten in the November election. 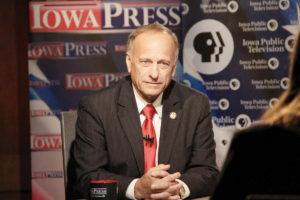 Yes, we fully expect to endorse one of King’s Republican challengers in the June 2020 Republican primary in Iowa’s 4th District, a sweep of 39 counties. But we are not joining our colleagues at other Iowa newspapers — from The Sioux City Journal to The Fort Dodge Messenger to The Des Moines Register, to name a few — in calling on Congressman King to resign. We think the congressman should stay in office as a diminished representative, one with no committee assignments, a legislator with two arms and a leg tied behind his back, as an object lesson to voters in Iowa’s 4th District who looked the other way for years at his racist words and outrageous observations. The people of this district deserve two more years of King’s disastrous time-management as a moon-howling fabulist more interested in spinning fantastical ideological yarns than engaging in the hard slog of legislating on rural development or a raft of other issues. Add to this, for the 16 months until the primary, King’s use of our congressional platform, the lift of our collective voices (which were heard fair and square at the ballot box), to serve as his own litigator in the court of public opinion. Should King choose to stay in office, and his defiant fund-raising email Wednesday suggests he’ll do just that, we would, in an appeal to common sense and frugality, call on the congressman to reduce his staff in Washington, D.C., as he has no committee work for them to do. Elections have consequences. King is the consequence for the complicity of far too many Iowans. He is the congressman they elected — and the one they deserve. Voters here can’t play the role of a newlywed bride surprised when her husband, inhibitions loosened with the sweet coconut of piña coladas on the honeymoon cruise, slurs the truth of his closeted infidelities below deck the night before. Western and central Iowans went into the November election with eyes wide open. Since 2002, when King emerged from a competitive primary (in which former Iowa House Speaker Brent Siegrist of Council Bluffs had peerless credentials) and cruised through the general election, we have interviewed King well more than 100 times — at least. His comments have been head-spinning. It’s like a bad stand-up act suddenly had unlimited congressional stationary and other official trappings of power. King once sent out a news release of himself sitting in one of Saddam Hussein’s thrones. He told us in Jefferson that he doesn’t think he’ll see any gay people in heaven. In July 2006, King went to the House floor to display the model of a wall the Kiron Republican said he personally designed for the U.S. border with Mexico. He delighted in demonstrating — as if at some Nationalist Youth Science Fair — how the electrified wire could really hurt, but just not kill, the brown people seeking to breach it. He defended torture at the Abu Ghraib as mere “hazing.” And he compared immigrants to stray cats. Then there’s his anatomical takedown of Latinos — arguably his most infamous quote. In 2013, King, a fierce opponent of a path to citizenship for immigrants in the United States without proper papers, said he didn’t agree with the suggestion that many youths who aren’t legal citizens are also high-achieving. “For every one who’s a valedictorian, there’s another 100 out there that weigh 130 pounds and they’ve got calves the size of cantaloupes because they’re hauling 75 pounds of marijuana across the desert,” King said. Sioux City Diocese Bishop R. Walker Nickless — the leader of the Catholic Church, King’s religion, in much of King’s district — said at the time that King’s comments on immigrants are “disappointing” and detract from the “dignity” of human beings. “I am disappointed by Representative King’s remarks, which speak of migrants in a way that undermines their human dignity and the respect owed them as children of God,” Nickless said. Early in his congressional career, King would regularly stop in Carroll for interviews with us. He lives a little more than a half-hour drive from Carroll in rural Kiron. We gave him generous amounts of ink to air his views, for coverage of his events here. So when did we know King was a racist? We can give you a date: 2003. Because of his concerns about the impact of war protests in America, King went to get a firsthand view of the anti-war demonstrations and speeches in Washington, D.C., just after the war in Iraq started in 2003. The congressman spent about 90 minutes among war protesters around the Washington Monument and other places in the nation’s capital. One episode stood out to King, and he described it to us during an interview. “I saw a big, powerful, angry, black man come up to the flag, the flags that were held along the streets by the ‘Support Our Troops’ people, and he was just screaming, ‘Burn that racist flag! Burn that racist flag!’ ” King said. For nearly two decades, we have reported how King sees the world — The Book Of King, if you will. So have other newspapers and media outlets in this district, and around the world. Yet King didn’t just win here in Iowa’s 4th Congressional District. He racked up landslide numbers — 73 percent in Sioux County, 61 percent in Shelby County and 59 percent in Sac County — in 2018, and just weeks after ugly reports of King’s very public consorting with an Austrian political party associated with neo-Nazis and his endorsement of a white nationalist, Faith Goldy, for Toronto mayor. We drove through Kiron two weeks ago, and the hamlet is struggling, but King has time to worry about who is making zoning decisions advantageous to white people in Canadian cities? Would it be better in the short term if King were flushed from public life? Yes. And a resignation would bring that solution. But like the teenager caught doing something foolish, the best remedy, the true learning experience for the Steve King voter, comes through a healthy dose of embarrassment.